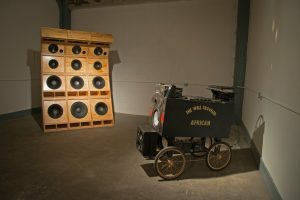 Jamaican artist Cosmo Whyte will give a talk titled, “Guess Who’s Coming to Dinner,” about his multidisciplinary practice on Thursday, April 13 in Gorgas 205, 7:00 p.m. Whyte employs drawing, performance and sculpture to create conceptual work that explores how notions of identity are disrupted by migration. His visit is sponsored by The Kirby Endowment and the Department of Art and Art History. More about Whyte here: http://www.cosmowhyte.com/. For more information, contact Jane Cassidy jcassidy@ua.edu.